Need advice? Contact us to book in for an initial consultation. In deciding upon an appropriate course of action in the legal arena whether it be deciding to institute proceedings, gathering evidence and discovery or deciding on how much money one should accept to settle a case, it is important we, lawyers and clients, try our best to use proportional thinking. Proportional thinking can serve as a tool directing attention to different aspects of what is implied in any rational assessment of what is too much and what is too little. It is an explicit value judgment as to what is just right, rather than a simply intuitive or reactionary assessment. Sometimes a principled position needs to be the subject of a fully contested hearing to prove the other party is wrong and bad and has always been so, but other times it may be better to settle early and to compromise on those precious principles when one takes into account the financial, physical, social and emotional costs of litigation. It is always the case that the longer the dispute continues the higher the legal fees will be. It is not always the case that the more money one spends in legal fees the better will be one’s outcome. Litigation is guaranteed to be uncertain to some degree. In relation to legal costs, Courts are going to apply proportional thinking as to whether and to what extent a “winner” can have their legal costs paid by the “loser”. Thus, one can win but not recover one’s legal costs because the Court may well form the view that all or part of the legal costs incurred were out of proportion to the value and importance of the matters in dispute (for example, one could sue in defamation but only obtain $1 in damages with no order as to costs, a Pyrrhic victory indeed). Winning a Court case could ruin you! Moreheads Lawyers recommend that proportional thinking be applied when selecting the best pathways given the options we will advise are open and worthwhile. Having clients who provide us with proportional instructions is very important to the success of our practice of the law. Keep in mind that we apply proportional thinking in providing advice. Michael Morehead graduated from the University of Tasmania Law School in 1989 with first class honours. 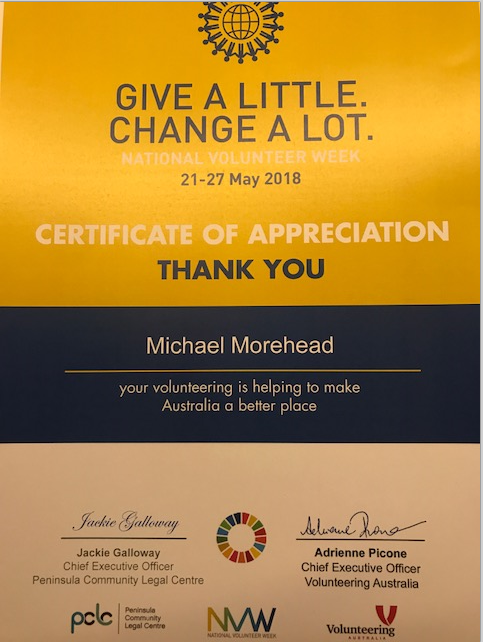 He then worked for a top Sydney law firm and gained admission in NSW before taking up an associateship at the High Court of Australia.Michael has worked from the Portsea office for many years and is a long term volunteer at the Peninsula Community Legal Centre. He is experienced in complex litigation and transactions and regularly instructs and appears in all Australian jurisdictions. Michael enjoys working in all areas of law with a special interest in the areas of public interest environment law, marine law, intellectual property law and family law. According to Michael “cost effective resort to the law is critical in obtaining excellent legal outcomes”. "I appreciate every effort made by you. A fresh start as they say… thanks to the dedicated team at Moreheads Lawyers. Hard work never goes unnoticed." "Villy saw me straight at the firm. He sat with me and took details of my situation, and showed compassion and empathy as I sobbed my way through parts of the discussion." "We couldn’t have asked for more. Our lawyer went above our expectations of what we thought possible." "Happy as I could be. My lawyer was very patient and I was satisfied with the help I received." "We hope never to need a solicitor but if we do, then we hope it’s you." "He put up with my endless barrage of emails and text messages, often calling me after working hours to discuss issues I had brought up. He was terrifically patient and did not once make me feel as though I was a hassle." "You understood my matter very well and obtained excellent results. Just keep doing what you all …and no need to change anything." Moreheads Lawyers acknowledges the Traditional Owners of Australia. We pay our respects to all community Elders, past and present.